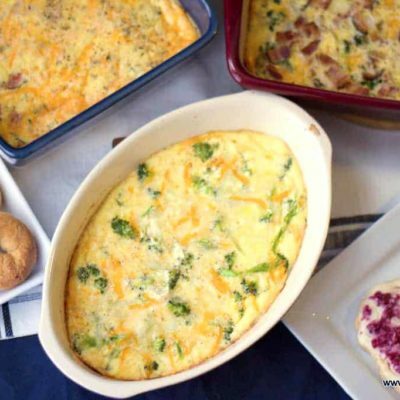 This is the ultimate easy egg bake or crustless quiche recipe. 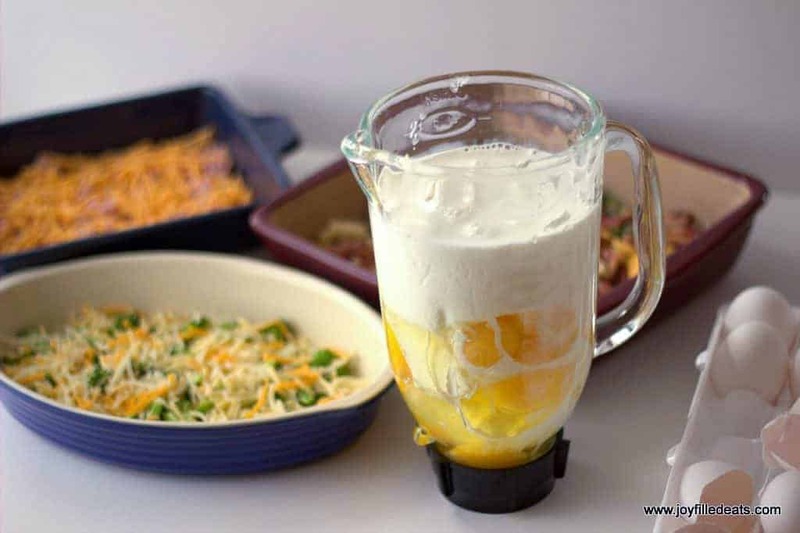 You make one egg mixture and choose your own veggies, meats, cheeses, and spices to go in it. It is low carb, keto, grain and gluten free, and THM S.
You can make a few different flavors at once like I did for brunch last Sunday. You put the meat and/or veggies in the bottom of a greased dish, sprinkle on cheese and seasonings, pour on egg mixture. Done. It comes out perfectly every time. 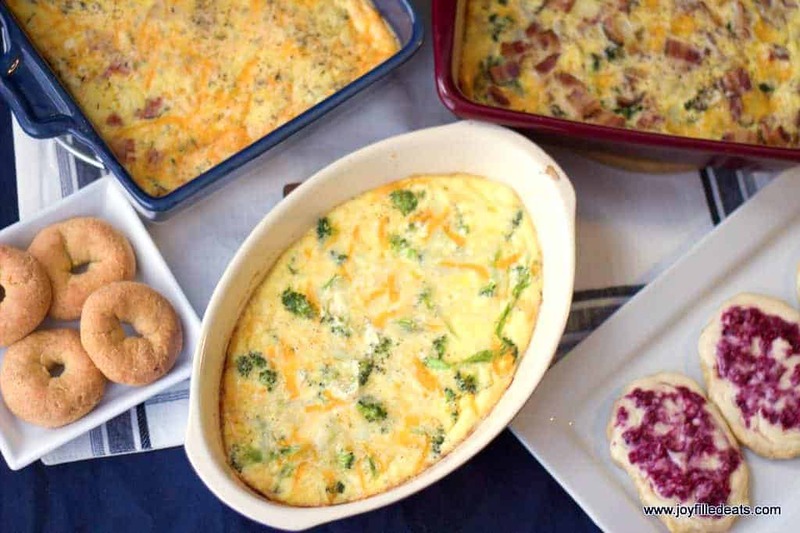 I served this Easy Egg Bake with a Raspberry Danish, Mini Bagels, and fresh berries. It was a gorgeous brunch spread. 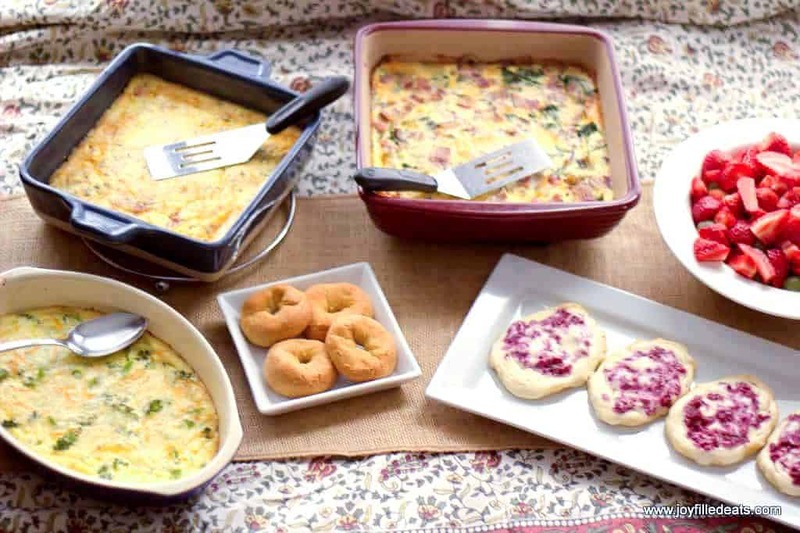 Here are all my brunch recipes in one spot. 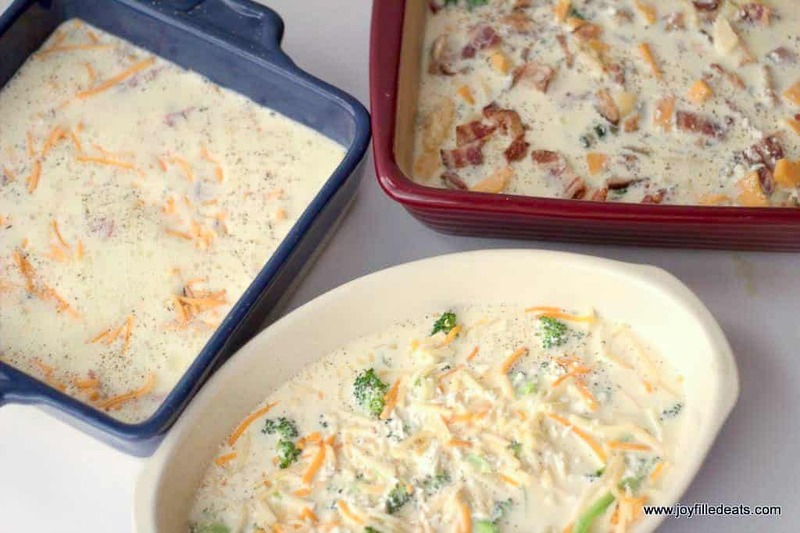 This Easy Egg Bake is as simple as blending a few ingredients and adding your favorite toppings. Give it a whirl and pour over the toppings. That’s it! 1/2 tsp dill, basil, oregano, parsley, etc. For the three egg bakes in my photos, I tripled the egg mixture (this was to serve 4 adults and 9 children for brunch) so I used 12 eggs, 12 oz (1.5 blocks) of cream cheese, 1 cup half and half, and 3/4 tsp salt. Cook 1 onion in a frying pan sprayed with cooking spray until soft and golden. Add 5 large sliced mushrooms. Cook until softened. Add a large handful of spinach. Put in the bottom of a baking dish sprayed with cooking spray. Sprinkle 1/2-1 cup shredded cheese on top (I used a pre-shredded mixed blend) and crumbled bacon (I used 8 slices). Sprinkle 1/2 tsp. dried basil and 1/2 tsp. dried garlic over the cheese. Pour egg on top. Bake for 30 min or until the egg isn’t jiggly and the edges are golden brown. 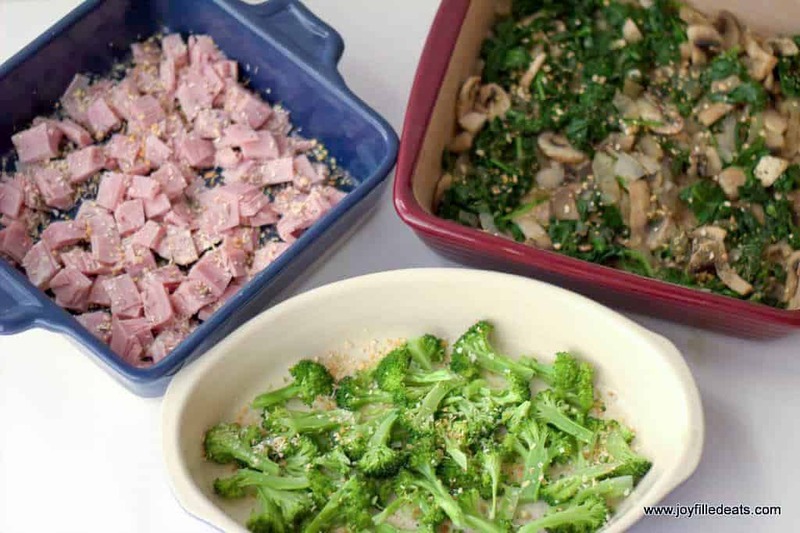 Put about 1 cup diced ham in the bottom of a sprayed baking dish. Sprinkle on 1/2-1 cup shredded cheddar, 1 tsp driec minced onion, 1/4 tsp dried thyme, and 1/4 tsp dried minced garlic. Pour egg on top. Bake for 30 min or until the egg isn’t jiggly and the edges are golden brown. Cut 1 head of broccoli into small pieces. Steam in the microwave or a saucepan until tender. Put in the bottom of a baking dish sprayed with cooking spray. Sprinkle 1/2-1 cup shredded cheese on top. Pour egg on top. Bake for 30 min or until the egg isn’t jiggly and the edges are golden brown. Put the egg mixture ingredients in a blender and blend until smooth. Spray a baking dish with cooking spray. 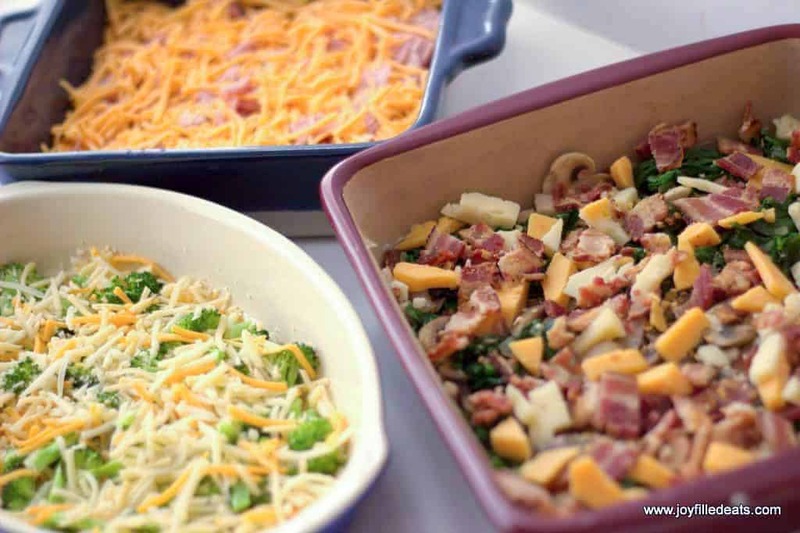 Put the topping in the baking dish: meat or vegetables on the bottom, then sprinkle on the cheese, finally sprinkle on seasonings. 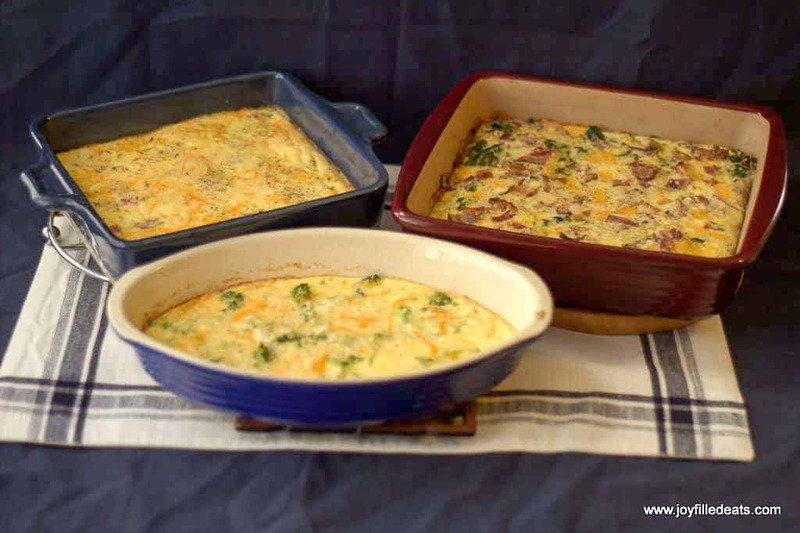 Bake for 30 min or until the easy egg bake isn’t jiggly and the edges are golden brown. Cream cheese is one of my favorite things ever. It makes everything better. 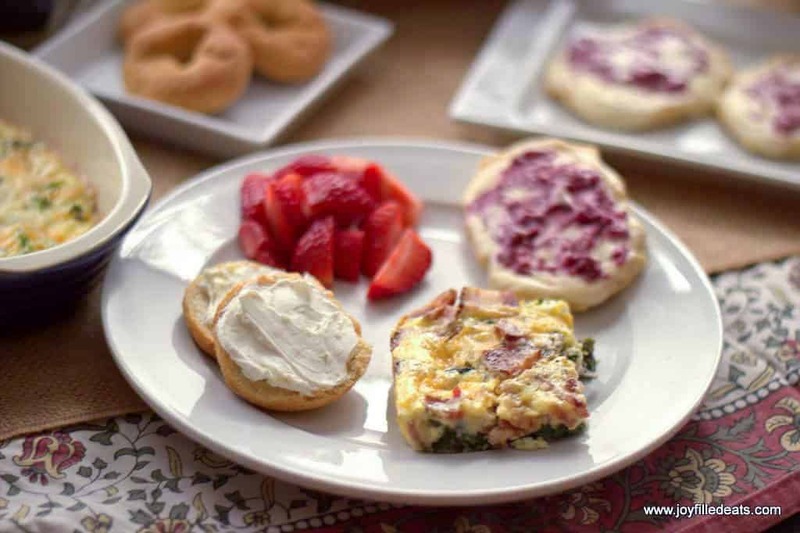 Cream cheese and bacon. lol. Thank you for this recipe! It's delicious and has quickly become my Sunday morning go-to! Have you ever tried preparing ahead of time and freezing for later? I haven't frozen this but in general egg bakes can be frozen. Looks so good! If I make this on a Sunday night for breakfasts during the week, will it be ok in the fridge through Friday morning? Yes. I keep it up to 5 days. Can I just use HWC in place of Half & Half? Never usually have H&H here. So delicious and not overly “eggy”! I did mushrooms, baby spinach, bacon, and feta cheese in mine and I must say it was the best breakfast casserole I have ever made!! Thank you so much for this wonderful recipe!! Half and half is close to light cream in the UK I sub it fore some of the recipies I get from over there. It's not exactly the same but close. Ive finally made this in a pie dish and it was soo yummy! I just made the plain egg and cream cheese and we had it with stewed tomatoes and crispy bacon. We had enough for work lunches the next day. Its even better cold! I used a strong cheddar for the top. Didnt use half/ half (i can get it here in nz). I used cream. Hi Taryn. This looks yummy and pretty straightforward to make. What size baking dishes do you recommend? Thanks! I normally double it and bake in a 9 x 13 pyrex. For a single batch an 8 x 8 works well. You can make it thicker it just takes longer to bake. Do you bake it the night before or just put it together and then bake next day? Thank you!! I prep it and then put it in the oven the next day. Can you make this ahead of time and refrigerate overnight? Yes! I do this almost every weekend. Half milk and half cream. It is common in the US. Thanks Taryn. Common in the US, not in New Zealand! Thanks for your help! Fluffy, creamy, goodness! I used ham and bacon, with light sprinkle of onion flakes. Delicious! Thank you! I made the cream cheese egg bake for our Christmas brunch. We all loved it! I doubled the recipe and made one with bacon, one with sausage; added sautéed kale and sweet peppers. Very easy and delicious! Thanks.